Former Braves scout Rance Pless saw good things when he saw the high schooler Danny Weems pitch, he told The Greeneville Sun years later. "Danny Weems had a heckuva' arm," Pless told The Sun in 2008. "We wanted to sign him out of high school. We thought he had a good chance of making it with the right amount of work." Weems ended up working for six seasons, working himself to AA, but he never worked himself to the majors. Along the way, though, he threw a minor league no-hitter. 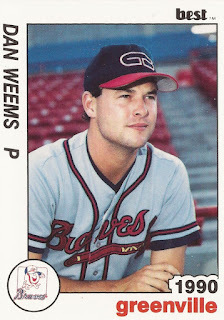 Weems' career began in 1985, taken by the Braves in the 28th round of the draft out of North Green High School in Tennessee. Weems started with the Braves at rookie Pulaski. He went 3-4 in 13 outings, 10 starts. He had a 6.18 ERA. He played 1986 between the rookie Gulf Coast League and single-A Sumter. He took a no-hitter into the sixth inning of a July GCL game. His 1987 was spent with single-A Charleston, still in the Braves system. It was that June 3 that Weems threw his no-hitter, blanking rival Greensboro. Weems moved to single-A Durham for 1988. He went 13-8 and had a 3.29 ERA. He then split 1989 between single-A Burlington and AA Greensboro. His ERA increased to 4.65 between the two levels. Weems then played 1990 between three levels, Sumter, Durham and Greenville. In 40 outings, five starts, he picked up four wins and a 5.62 ERA. It was his final season as a pro.